In my effort to be an 85 year old 35 year old, I needlepoint. I knit. I wear nightgowns with pockets (pockets are good for kleenexes), I enjoy watching the BBC. And I know I am not alone. Hey you crafter makers out there! And spouses or children or siblings of crafter makers out there! I have some gift ideas for you. First of all, some guidelines for shopping for us crafters. We love new supplies! But we also love ideas. Most of us belong to Ravelry but so… to shop for your knitting gift receiver pick up some yarn from the local knitting store. Don’t be overwhelmed by the selection, pick some color or size that you think is pretty. My local store is super helpful and if yours is anything like it, they will ask about the project ideas and recommend quantities of yarn for the project. For the idea? Voila! 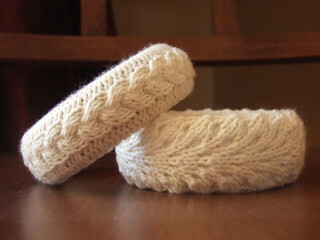 Here is the link for the pattern above See Mi Knit’s pattern. 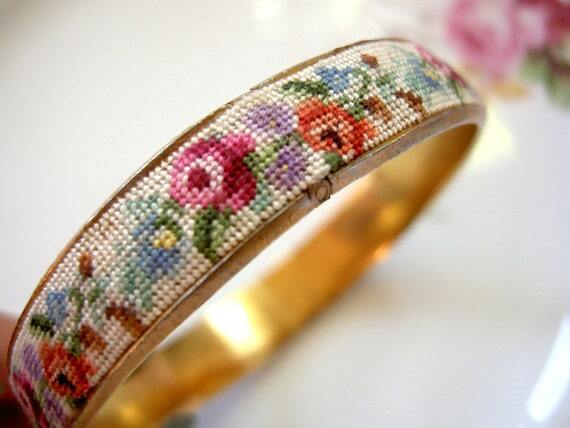 Ideally you would find a needlepoint bracelet bangle KIT for your beloved needlepointer. But the only ones I could find sucked big time. I guess you could swap out thread (floche) colors to improve them but lacking that, I recommend this Etsy vintage find. I would wear this and claim I had made it myself. Then I would feel bad and attempt to make an identical one. For the perfectionist crafter, we gotta talk Martha Stewart. You’ve got to do some legwork here. Look at the various Martha Stewart project videos. Pick a style you like, find basket, pickup the required supplies, stuff the supplies and a bottle of nice wine into the basket, then type up a pretty card with the URL hand written in it for her reference. VOILA you too channeled your inner Martha making something special. Next > Me Me Me ME! So I was poking around in my conversation with my mom about this to find out what supplies she might like. I think I have just accidentally roped myself into joining her crocheting club. I should have just gone to ask someone at a store like you’ve mentioned! Hahah! That is awesome. I hope there are a few non elderly ladies in the club, but regardless, you’ve just given your mama the best gift ever! She gets to show you off in crochet club AND rope you into her interests. That’s basically my mom’s entire reason for existing. P.s- Martha Stewart is just a dynamo, isn’t she? How does she have the time in her day to do these things?? I’m a happy crafter maker and I love Martha Stewart. These are really nice gift ideas! Crafter-Maker high five to you! I absolutely LOVE that needlepoint bracelet! So unique and beautiful. Me too. I knit, although not lately. I’m all about pockets, I watch only BBC and even worse – I listen to the radio (wyfi BBC radio). Young-old ladies unite!